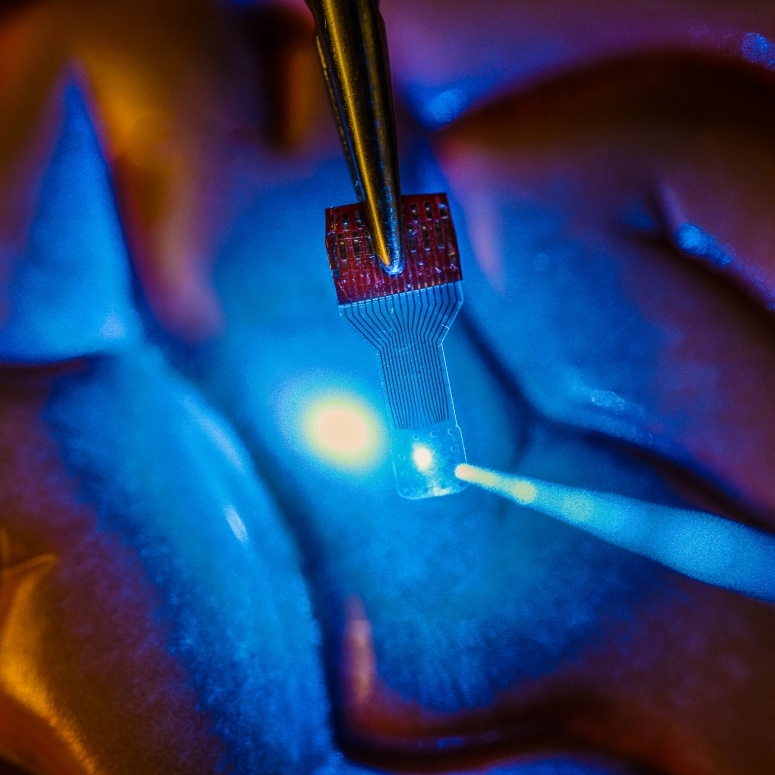 In 2014, when University of Wisconsin–Madison engineers announced in the journal Nature Communications that they had developed transparent sensors for use in imaging the brain, researchers around the world took notice. Then the requests came flooding in. “So many research groups started asking us for these devices that we couldn’t keep up,” says Zhenqiang (Jack) Ma, the Lynn H. Matthias Professor and Vilas Distinguished Achievement Professor in electrical and computer engineering at UW–Madison. Ma’s group is a world leader in developing revolutionary flexible electronic devices. The see-through, implantable micro-electrode arrays were light years beyond anything ever created. As a result, in a paper published Thursday (Oct. 13, 2016) in the journal Nature Protocols, the researchers have described in great detail how to fabricate and use transparent graphene neural electrode arrays in applications in electrophysiology, fluorescent microscopy, optical coherence tomography, and optogenetics. “We described how to do these things so we can start working on the next generation,” says Ma. Now, not only are the UW–Madison researchers looking at ways to improve and build upon the technology, they also are seeking to expand its applications from neuroscience into areas such as research of stroke, epilepsy, Parkinson’s disease, cardiac conditions, and many others. And they hope other researchers do the same. Funding for the initial research came from the Reliable Neural-Interface Technology program at the U.S. Defense Advanced Research Projects Agency. Other authors on the Nature Protocols paper include Dong-Wook Park, Sarah Brodnick, Jared Ness, Lisa Krugner-Higby, Solomon Mikael, Joseph Novello, Hyungsoo Kim, Dong-Hyun Baek, Jihye Bong, Kyle Swanson and Wendell Lake of UW–Madison; Farid Atry, Seth Frye and Ramin Pashaie of the University of Wisconsin-Milwaukee; Amelia Sandberg of Medtronic PLC Neuromodulation; Thomas Richner of the University of Washington; and Sanitta Thongpang of Mahidol University in Bangkok, Thailand.